If you aren’t familiar with the game, here is a great video from @Byronyk that will show you all you need to see about Star Citizen in 6 minutes! Or you can read below for a few of the more important bullets about Star Citizen. 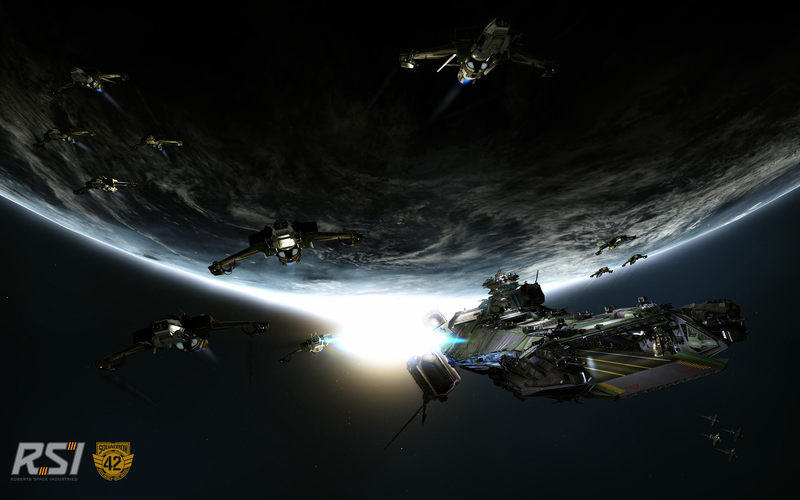 Star Citizen is being developed by Cloud Imperium Games under the direction of Chris Roberts. Star Citizen is both single player and multiplayer. The single player component is called Squadron 42. Star Citizen is a massively multiplayer online space sim. Squadron 42 will have the option to play cooperatively with other players. In Star Citizen players will be able to choose their path and play as anything such as a fighter pilot, to exploration, industrial roles and everything in between. In Squadron 42, players will take the role of a pilot in the UEE Navy. The flight model is being designed to be as realistic as possible and the engine includes newtonian physics. Combat in space will largely rely on player skill and not a character level or necessarily which character has the better gear or equipment. IE – not pay to win. Players currently can back the game by pledging in the RSI store on www.RobertsSpaceIndustries.com. Pledge packages include a ship and can range from as low as $30 to well over $200. Any ships purchased via pledge can also be earned by playing the game upon release. Certain ship packages also include a fully copy of the retail game upon release in addition to access to the beta test. The game runs on the CryEngine 3 game engine from the popular game Crysis 3. Star Citizen will be a performance hog at the reward of beautiful scenery and stunning detailed graphics. It is highly recommended to wait to build a computer for Star Citizen until high performance parts become more affordable. For example: the GeForce 700 series graphic cards are not expected to be able to run the game at the maximum amount of detail and maintain good performance. Star Citizen is being released and tested in modules. The first “playable” module is the Ship Hangar, which has already been released. Any player that has bought a ship package that includes hangar access can access the Hangar Module. The Hangar Module allows players to walk around inside of a sealed hangar with the ship that they have purchased and inspect it. Most, but not all ships are available in the Hangar Module. The next module is due out within the next week or two. Arena Commander, sometimes called the Dog Fighting Module will allow players to fly around in ships that they have purchased in Free Flight mode, fly against computer controlled enemy ships in Vanduul Swarm, or compete against other players in three combat modes, Battle Royale, Squadron Battle, and Capture the Core. Future modules will include various features such as multi-crew ships, ship boarding first person shooter mechanics, planetside mechanics and much more. The final game, called the Persistent Universe, is due out in late 2015. Still looking for more? Check out the official Star Citizen Overview produced by Chris Roberts himself! Check out other Star Citizen content here at The Lone Gamers. Check out all of our Star Citizen content by visiting the Star Citizen post category or viewing the Star Citizen tag category here at The Lone Gamers.